Changes are afoot over at Mercury Air Cargo's Los Angeles location, with employees moving over and others moving up. "In every organization, it's good to keep people challenged to some degree," said Chief Operating Officer and Executive Vice President John Peery. "That's what the intent is: to move people to new locations so no one gets stayed, and they look at things with a different set of eyes, which sometimes, comes with a different solution for issues that are occurring," he said. 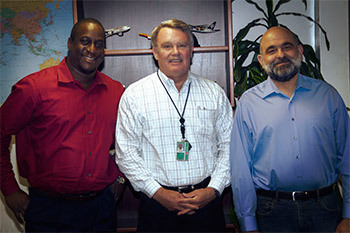 Reggie Harris, who began his career with Mercury 18 years ago as a dock manager, is now the Terminal Manager of the Avion Building, Building 213. He is supported by Don Maas, a long-term manager that has been with Mercury for more than 25 years, who will be the Assistant Terminal Manager. Bob Mayar, the General Manager for Los Angeles, has relocated as General Manager and Terminal Manager for Building 216, otherwise known as the Jal Building. Peery explained that due to the size of the Jal building and its layout, two assistant terminal managers manage the building: Mario Palomarez, an employee with Mercury Air Cargo for 15 years, and Rigoberto Cabrera, who brings 35 years of experience with Lufthansa. Palomarez and Rigoberto will share assistant manager duties for the building, one on the south side and one on the north side of Building 216. Viviana Ngo is now the Customer Service Manager at Building 216. Richard Stumpp remains the Terminal Manager and Director of Cargo Operations, and he is supported by Paul Rendon, the Assistant Terminal Manager. Orlando Solis previously served as the Operations Manager for Air Bridge, and he will take over as the Graveyard Operations Manager.